Once the porcelain sky had ruptured and the rain had finally cleared, the Canadian section of the ALCAN proved to be nothing short of stunning. Being so late in the season, it was surprisingly free of Monster RVs too. First impressions? No bullet holes in the road signs! The roads weren't as good as in Alaska, but it was good to see more efficient, European-sized cars around. Road touring doesn't get much better than this. We’ve now arrived in Whitehorse, which at 22 000 people or so, is the Yukon’s largest settlement. 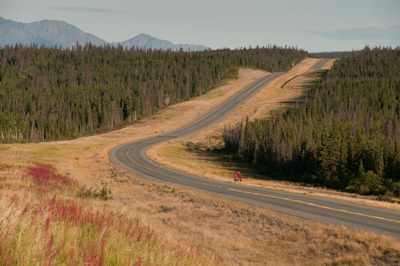 While the setting is idyllic (its local singletrack comes highly recommended by Alaskan riders), Whitehorse itself sprawls out far beyond it’s charming 50s-fronted downtown, with the delights of McDonald’s and Wallmart rearing their corporate heads in welcome. Not that we had much time to take it all in. No sooner had we arrived and tracked down the organic bakery, than we were invited for dinner and a place to rest our heads with Marlynn, a French Canadian who’s lived here since the late 80s. There, we feasted on a delicious homemade dinner (real food and wine! 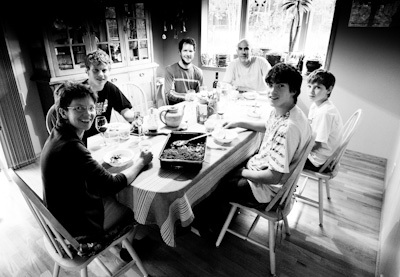 ), with her environmental educationalist/folk musician husband Remy, and their biking skiing outdoorsy kids. We were also joined by Parisian Sibylle, in town researching and interviewing for a UN film on climate change; our touring bikes had caught her eye as she’d done her own year long bike ride some 10 years before. Sibylle’s last project, 6 Billion Others, was with the incredible aerial photographer Yann Arthus Bertrand. 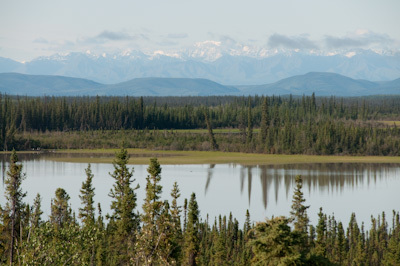 The St Elias range, home to the largest national park in North America. 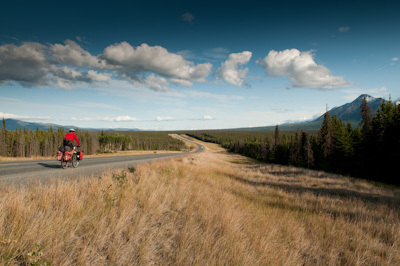 Its about 660km between Tok and Whitehorse along the Alaska-Canada Highway (the ALCAN). 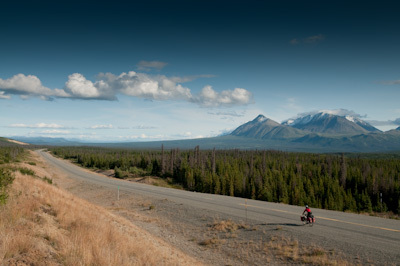 After the roller coaster of the Dalton Highway, the ride itself was refreshingly easy going, paralleling the mighty St Elias mountain range almost all the way here – a long string of jagged, snow capped peaks rising high above the broad valley floor, nurchuring some of the biggest glaciers outside the polar regions. Plans for the ALCAN were long in the pipeline, but the Great Depression of the 30s put them on hold. It wasn’t until the attack on Pearl Harbour in the WWII that construction went ahead, with the highway completed in 1942 and running at over 2200kms long. 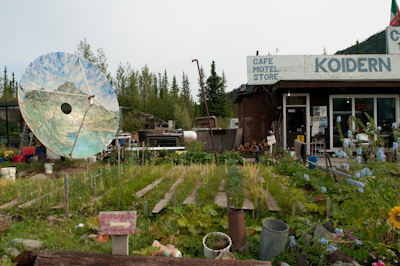 The Three Bears in Tok was one of the best stores we've came across so far - or maybe we were just hungry. 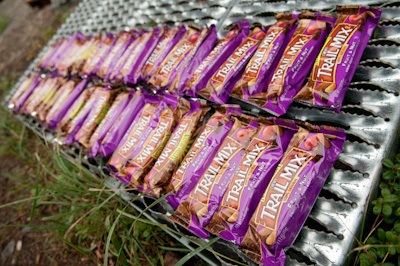 Several of the roadhouses on the way to Canada's Haines Junction have shut down for the season, or for good (blame the economic climate and the Monster RVs), so we loaded up on no less than 47 trail bars to keep us ticking over. To be honest, we weren't too sorry to be leaving RV and tourist-trinket-Tok. With the caribou season coming up, hunters were swarming all over the town. 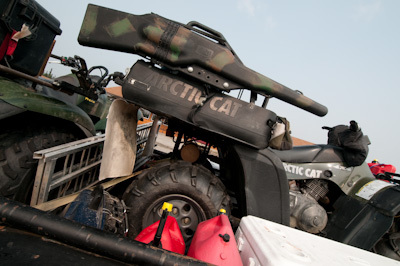 A bunch of the pickups were pulling these little quads, complete with bolt-on firepower and mini trailer for hauling out their kills. I can completely understand subsistence hunting (after all, how natural is it to buy a slab of pre-packaged meet from an enormous supermarket), but the concept of trophy gathering escapes me. Here's one they got earlier. Why the long face Mr Moose? Perhaps it's because I got shot, stuffed, and now I'm spending the rest of my days in front of this crappy tourist shop. We’d toyed with the idea of spending a rest day in Tok, but despite our tired legs there wasn’t much to keep us there; a rain storm that lashed down on the tent gave us a good excuse to lie in. Back on the road, we made the most of the strong tailwind to head onto to Northern Junction, were we met a group of 40 young riders from Texas, who’d ridden their road bikes from Austin in 70 days to raise awareness and cash for a cancer charity – on apparently the world’s longest annual charity ride. 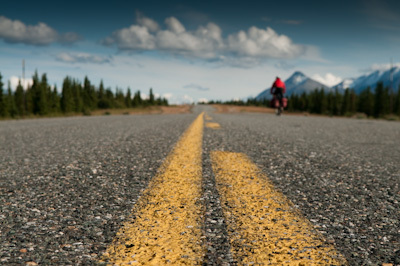 Texas to Anchorage is a long, long way and amazingly, most of them had never really cycled before, having bought bikes for the trip. The sun came out for our crossing into Canada, complete with Simpson Clouds. Last chance to stock on some wholesome American food (long life Danish pastries). From here, it was just a short hop across the border, crossing into the Yukon at Canada’s most westerly settlement, Beaver Creek. Mountains loomed close to the road, covered in forest like a pelt of winter fur. And it certainly feels like winter is drawing closer. 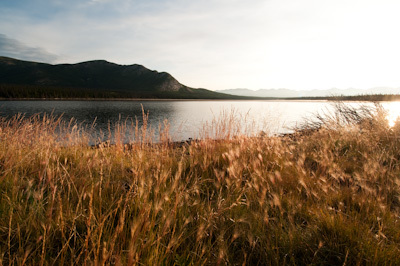 The morning were fresh and chilly, and the days were becoming shorter – from an average high of 21 hours of sunlight a day in June, the Yukon dwindles to ‘just’ 16 hours in August. 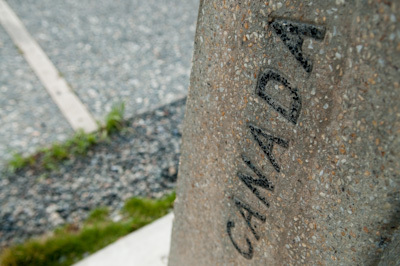 The official border line - we had lunch in Canada. Apparently the divide between the US and Canadian border is the longest undefended border in the world. 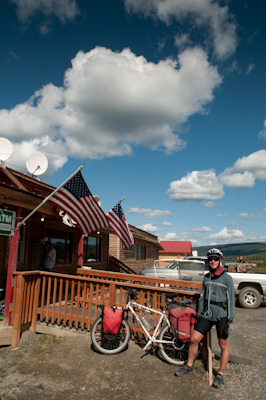 With so few places to resupply, almost every cyclist travelling the ALCAN will end up stopping in at Jim and Dorothy’s roadhouse, and probably the vast majority will have had a pretty bizarre experience. A cantankerous yet endearing old couple (the moment I walked in through the door, they recounted how they’d lambasted a German cycling couple just the day before for dripping water on their carpet), they’ve lived in the Yukon for some forty years, and their shop is a confusing accumulation of knickknacks and brickabrack – rocks, decorative spoons, stuffed toys, 2nd hand books, popcorn, paintings. You name it, you’ll find it. 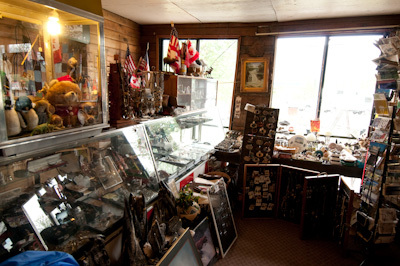 Just a fraction of Jim and Dorothy's lair. I particularly liked Dorothy's gold-sequined sun cap, but was too fearful of her to ask to take a picture. 'Where do all the rocks and fossils come from?' I enquired, gesturing towards the random piles perched precariously on every available shelf space. 'A box under the table', came Jim's reply. 'Which comes out of my mind,' he added, as if by way of explanation. Apparently their satellite dish was painted by the Yukon Elvis - 'looks like Elvis, sings like Elvis, paints like Elvis.' Just as she was warming up, feisty Dorothy interrupted our conversion to leap out of her chair with age-defying agility, and yell at a couple whose dog she suspected had peed on her vegetables. 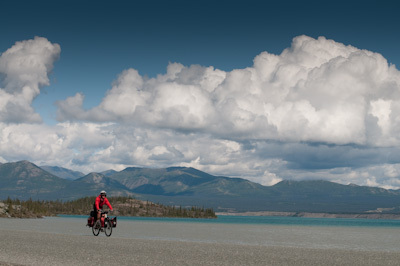 After several days of rain and overcast skies, the sun lifted our spirits and showed the Yukon at its best. 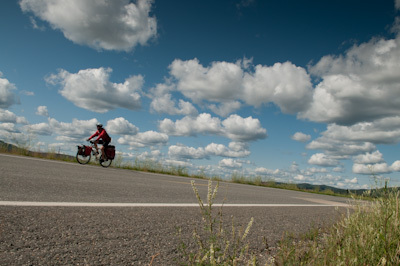 The road conditions were fairly flat, allowing us ride up to 70kms by lunchtime. These days we’re getting early starts; we’re generally on the road by 8.30am, giving us plenty of time to chill out at lunch, take breaks and stop for photos, and still cover 120-130kms a day. 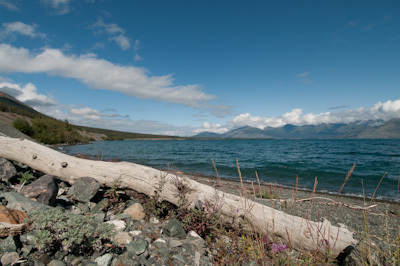 Kluane Lake, the largest in the Yukon, traditional home to the Kluane First Nation. Its waters shimmered a glassy turquoise. The steep side mountains rose up sheer and dramatic around us. 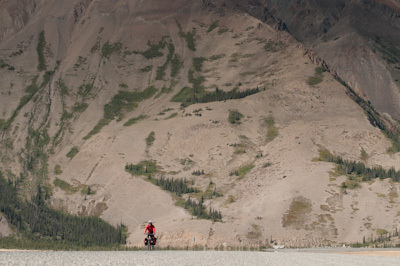 As the tourist blurb goes, Yukon: Larger than life. 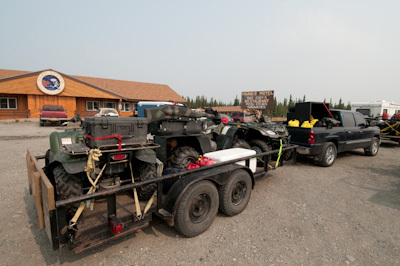 In Destruction Bay, we caught up with Dave1 and Dave2, both of whom we’d met on the Haul Road. Dave1 was contemplating whether to buy a can of ravioli for breakfast, but settled on a pint of milk, which he gulped down before setting off again. Dave2 was already long gone – he’s planning to be in Argentina in a year, so doesn’t have too much time to sit around and chat. Good luck to you both – hope to see you on the road again! After a short climb, a fast descent fed us past Mt Decoeli. We’d planned to push on all the way to Haines Junction, but Dan spotted a trail leading down to Sulphur Lake. Too good to resist. So with 125km on the clock, we pulled in for the night. Food after a long day in the saddle tastes good. Food with a good view tastes even better. A peaceful spot to start the day. A Swiss couple had the same idea, and parked up their funky, late 70s GMC campervan. Lush! 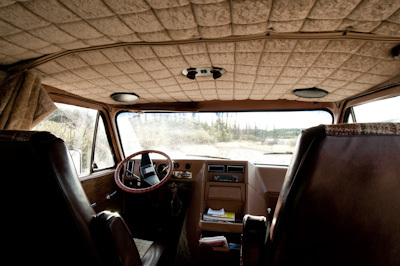 We admired its browny brown interior, including thick brown carpetting and ever-so-soft, puckered brown roof lining, as classy as travelling 1st class in a 70s plane, no doubt. 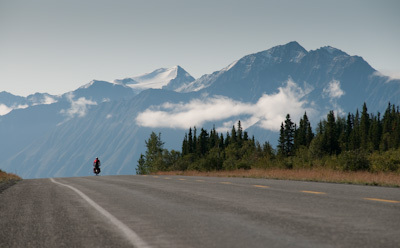 The next morning, we joined the highway for the last stretch into Haines Junction. Haines Junction came and went, a scenic, tranquil settlement surrounded by mountains, just a flightseeing tour away from Mount Logan, Canada’s highest peak. As you’d expect from its name, there’s not much to it. Turn left, Alaska. Turn right, Whitehorse. Best of all, its bakery was in a league of its own, with wifi access, platters of cheap Day Old food and a bohemian air. There, we met William, a quietly spoken individual also heading by bike to Latin America. William had a slightly sorrowful expression; the last couple of weeks of riding alone seem to have taken their toll on his spirits. By his own admission, he also needed to get in shape. He’d only planned the trip a month before leaving, and had already shed 35lbs from his 255lb frame. I always enjoy the instant connection with other tourers – we’re all experiencing similar highs and lows, sharing the same joys and frustrations that come part and parcel of bicycle touring. We suffer on the climbs, lament the headwind but draw inspiration from the beauty of the surroundings and the perfect pace that bicycle travel affords. Among others, we met a Dutch couple on Santos bikes, and fell into easy conversation, swapping notes and experiences. 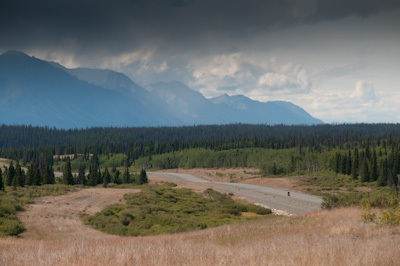 From Haines Junction, we escaped the culinary clutches of the bakery by late afternoon, camping some 50km down the road. The last push to Whitehorse was eased by a soundtrack of storytelling from The Moth and This American Life podcasts on the MP3 player – if you haven’t heard any of these before, they’re well worth downloading. Along the way, we past Canyon Creek Bridge, built in 1903 during the big gold rush that lead to the construction of the wagon road to Whitehorse – out of which, in turn, sprung the roadhouses and communities though which we were passing. 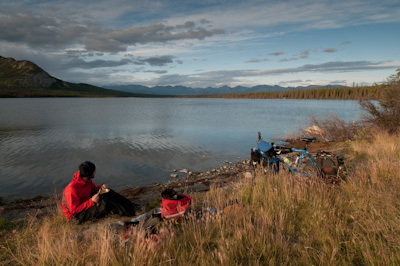 On and one we pedalled, through the Takhini river valley where the waters run rich with salmon and the coastal mountain range to the south gives way to the uplands of the Yukon Plateau. The Yukon River has always shaped human life in the territory, from natives to Russian fur traders to gold prospectors. 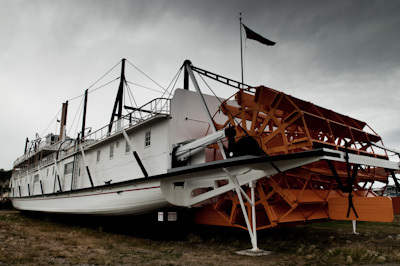 Sternwheelers like the SS Klondike journeyed from Whitehorse to Dawson City, carrying lead ore. In days before miles per gallon, it burned through two cords of wood per hour (a cord is an old english unit, a 4 by 4 by 8 foot bundle of wood) taking 36 hours downstream to get to Dawson City, and 4-5 days back again, navigating treacherous rapids along the way. The gas guzzlers of their time. Our friendly tailwind gave us a helping hand, almost leading us right to the bakery where Marlynn welcomed us into her home with real generosity and spontaneity. And so it is that we’ve now spent the best part of a few days treated to wholesome food, a warm home, family life, movies, live music, clean clothes and great conversation. Nat, one of their three sons, even took us on a chilled out ride around the local trails, a spider’s web of flowy, rooty singletrack (like the Blues Brothers trail), the perfect compliment to a couple of weeks of loaded touring. This evening, Dan has rustled up a trifle for desert (after our lovely salmon dinner) by way of thanks, as we prepare ourselves to finally leave this wonderful family and take to the road once more. 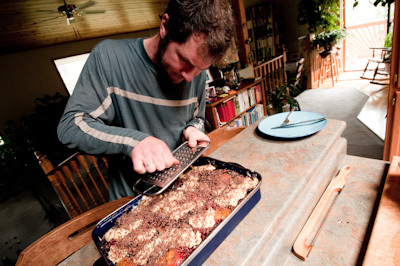 Dan, preparing his culinary delight - the Aussie version of an English trifle. It went down a storm. Marlynn, Remmy, Nat, Miguel, Nico and Dan. Thanks guys for your amazing hospitality. 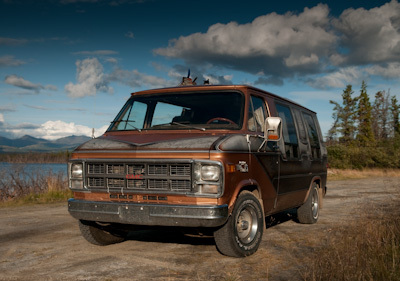 Within a couple of days we should be back in Alaska, overnighting in Haines (not to be confused with Haines Junction, on the Canadian side), ready to bob our way along the Marine Highway to Juneau, Sitka and beyond. 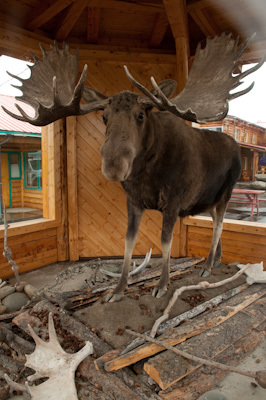 This entry was posted in Alaska, Yukon on August 17, 2009 by Cass Gilbert. Cass, your UPS shipment was delivered in Sitka today. Good to hear you’re meeting other Santos riders on your travels. Michael. Hey Cass…it almost feels like I’m there. Thanks for taking so much time to work on the blog. I’ve been backwards and forwards to Portugal a lot over the last month with more to come. Maybe the odd trip to the US as well…All well here…Sarah starts school again in a couple of weeks.